HOT OFF THE PRESS! New class schedule full of fun sewing events including Saturday Sampler! Welcome to our OPEN HOUSE! Hot off the press this weekend is our latest class schedule offering sew many exciting ways to develop your quilting skills, challenge yourself, and have FUN! Beginning quilting, bag making, wool dying, and our youth "Camp Sew Fun' are just a few of the summer classes you will find on our schedule. We're gearing up for three new block-of-the-month clubs including the much anticipated SATURDAY SAMPLER! 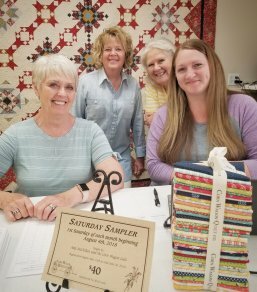 Our first Saturday Sampler members (smiling faces below) signed up yesterday and are officially ready for 12 months of mystery quilt fun. Registration is now open and will run through June 30th. 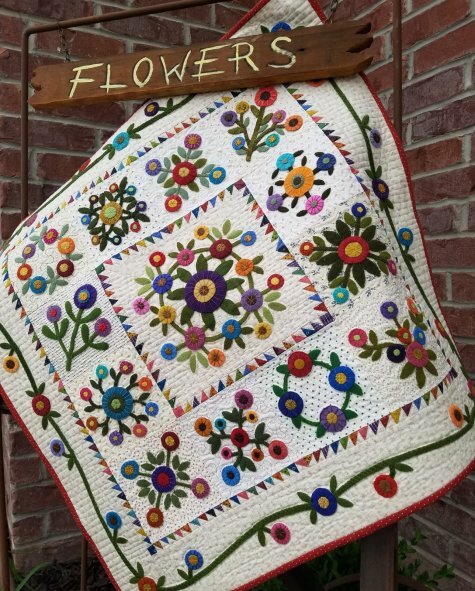 Amy McClellan of Under the Garden Moon has designed a beautiful skill-building sampler quilt exclusively for our shop. Our Saturday Sampler will take place the first Saturday of each month beginning August 4th. For all the details, rules and to register, please visit our website under "classes" or visit us here at the shop. 25% off one regular price item of your choice! Have you checked out the calendar feature on our new website? It's where you'll find a full listing of our classes, clubs, block-of-the-months, events and even our promotions such as Marvelous Monday, Wrong Price Wednesday and Stuff-a-Bag Sales! Have a look! Thank you for sharing your DNA. Now we are BOTH fabulous. You're sure to be her favorite this Mother's Day when you give Mom a Corn Wagon Quilt Co. Gift Card. 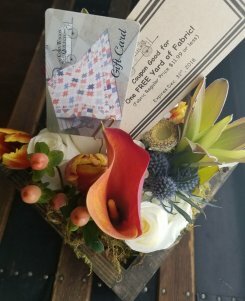 Now through Saturday, May 12th, for every $50 gift card you purchase, receive a coupon for ONE FREE YARD OF FABRIC! Wool penny bouquets in the most joyful shades of hand-dyed wool grace the top of our newest block-of-the-month sampler. Finishing 27" x 27" A Penny Gathering by, Lisa Bongean of Primitive Gatherings, makes a wonderful wall hanging or table topper fit to be displayed all the year round. This project is perfect for the beginner who has not had a lot of experience with wool applique. The blocks are small making it perfect to carry while traveling and easy to finish. This is one of three new block-of the-month clubs now open for registration. A Penny Gathering will begin June 1st, 2018. Kits will be available for pick-up after the first of each month. Shipping is available at an additional cost. Monthly Cost: $8.99/month. This BOM is a 14 month commitment. No refunds for cancellation. May 14th - - 25% off ONE CUT OF FABRIC! This sale includes all regular price fabric by the yard including cotton, flannel, minky and wool cut from the bolt. Every Wednesday our pre-cut fat quarters are only $2.25! Regular Price $3.25. Wednesday's Word is a special offer for our Facebook Friends and Instagram Followers. Every Wednesday you can find our social media post announcing Wednesday's Word. Repeat the word at the register that Wednesday to receive 25% off one regular price item. Friday, May 18th 10 a.m. - 11 p.m.
Saturday May 19th 10 a.m. - 7 p.m.
Bring any UFOs that are needing your attention and spend two days sewing non-stop! $89 retreat fee includes lunch both days, swag, snacks, games and prizes. See our website under classes for all the details. Sign up online or in-store today! The UFO number for May 10.